As moms, we will always see our sons as our little boys. No matter how much we don’t want it to happen though, they grow up. Navigating the teen years can be a bit tricky at times. Their emotions often run high and so do ours. Sometimes we have no idea how to communicate with them. And they don’t know how to communicate with us. So how can we talk? How can we navigate our changing relationship? How can we encourage them as they become young men? What do we need to know about what they are thinking and feeling? It starts by listening to what they have to say, even if they never say it aloud. Respect me and see me as capable. Believe in me and tell me I can do it. Talk to me, not just at me. Don’t put down my ideas and opinions, or treat them flippantly. I know I don’t know as much about life as you, but I’m trying to figure it out. Realize the world I’m growing up in is different than the one you grew up in. Know that I love you even though I’m starting to want to spend more time with my friends and ask their advice on things, too. Support me as I try to make the faith you raised me with my own. Recognize I’m excited about my future and scared all at the same time. See that I’m trying to navigate what it means to be a man and I don’t always know what that looks like. It is true. 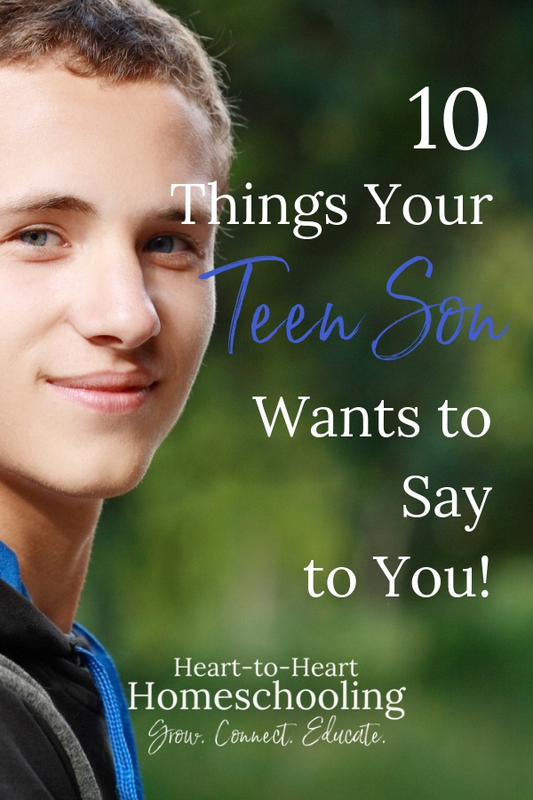 A lot of things your teens want to say to you might not ever be said aloud. But that doesn’t mean you shouldn’t be paying attention to what they are trying to say. They simply don’t always know how to express the things they are thinking or feeling. But by listening anyway, we communicate that we truly care about them. Several of the things they want us to know are based on their deep need to be respected because that is how God designed them. Why does Paul encourage wives to respect their husbands? I believe it is because it doesn’t come naturally for us as women. Ever since the fall, it seems we’ve been fighting God’s unique plan. Respecting our husbands doesn’t come naturally. But it does come supernaturally—through the power of the Holy Spirit. And of course this passage is speaking to wives. But our sons’ first relationship with a woman is us, Dear Moms. Wouldn’t it be great if how we relate to our sons set an good example of how God wants women and men to relate in marriage someday? What if how we treat our sons now spoke to their core need as men? What if overtime as we speak respect, we were speaking love to them? 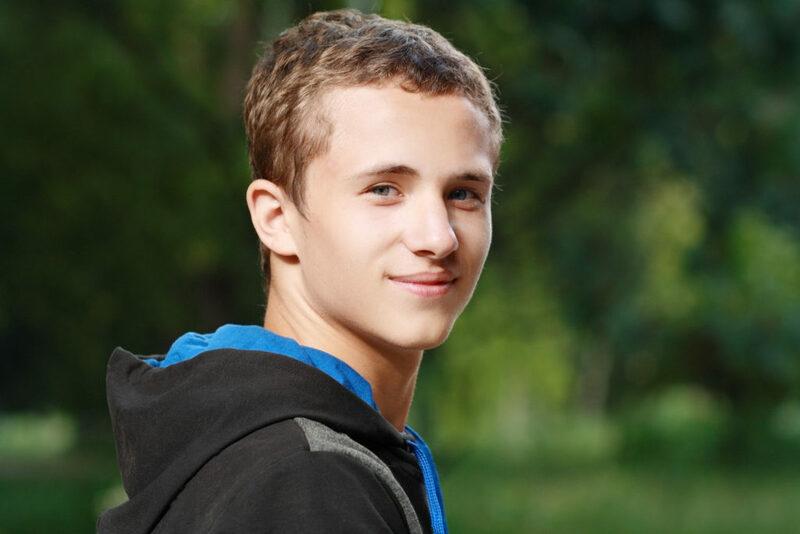 I wrote a guest post for Ben and Me, How to Show Respect to Your Teen Son. Mother and Son: The Respect Effect by Dr. Emerson Eggerichs. Mothers and Sons: Respect is the Secret Sauce from Lightly Frayed. Unconditional love is an action, not a feeling—choosing the best for others, putting their interests above our own, being patient in the process. Love tries to see life through others’ perspectives, to consider what it is like to walk in their shoes. It does’t expect perfection, but prays and hopes for their best. Unconditional love asks for forgiveness and gives it to others. Our family selfie on top of Pikes Peak. I wish I could tell you I know these things because I figured it out while they were still my little boys. Nope. I made mistakes and didn’t really listen at times. Often I gave my opinion without really considering theirs. I tried to prove I was right and they were wrong. But somehow we worked through it. Imperfectly, but with a lot of love and forgiveness on both our parts. What do you think about the list? Would you add any other thoughts? Are there things on the list that aren’t true for you? How can I help and support and encourage you? And perhaps the hardest question, what do you need me to do better? Please, keep talking to your teen sons. But spend a lot more time listening, even to the things they don’t say aloud. This all seems very true to me. I didn’t have any brothers, so my son was my first experience with boys. It’s been amazing to watch him grow up and become a man. It seems like he was about thirteen when he started advising us on things, and it took us awhile to realize that he usually knew what he was talking about. His aptitude was technology. When their strengths start to emerge, our pride may blind us to the fact that they’re beginning to know more than us in certain areas. When he was 20 he bought a small computer repair business, and has ended up doing work for two of the largest companies in the world. I think homeschooled boys have an advantage of being able to follow their passions and get a head start. Another story like that is the post I wrote about Baker Creek Heirloom Seeds which was started by a homeschooled boy. What a great story! Thank you so much for sharing your experience. I’ll go check out your post! What a great list! Thanks for sharing!! And as I am reading the book I found that it says the need for respect starts before they are teens. It is how they are wired 🙂 Never too early to communicate to our boys in the way they hear love best! We are a family with 4 boys and 1 girl. Your article us really important for me. Thanks for your sharing and your list ! good things for me to remember as my lad gets close to being a teen! it’s already starting now… 🙂 fun times with a maturing lad. The teen years are great (though challenging at times!). Just keep communicating with each other! great advice ! beautiful family ! I pinned it to my “raising boys,” board in Pinterest. I raised ONE, and I also approve of your list. Bless you in your ministry to your family and beyond! So thrilled to have found your article here. I JUST finished reading the Eggerichs book this week and wrote a review on it as well. Powerful truths. I grew up in a family of 4 girls and now have 4 boys – learning (gradually) to use respect-talk rather than my default language of love-talk. Thank you for sharing these truths. watching my 12 year old as he’s starting to reach to be a man is an amazing thing. I am so blessed. 🙂 Good list to be mindful of. actually, these 10 points are important when relating to our teen daughters as well. my husband, as a former youth pastor, felt quite strongly that we needed to treat them this way as a sign of respect to them as human beings made in GOD’s image. i think it was very helpful to them in terms of their being able to express themselves as they grew older and eventually went away to college. I absolutely agree 🙂 As a mom of boys, I wanted to write this from the things I personally learned through our relationship. But it so true! We all need love and respect. Thanks so much for sharing your thoughts on this! Very needed message! Great insights and truth. 🙂 Thank you for writing this to a sea of moms (and dads) who need to hear this. I’m in total agreement with you. My three sons (now grown) needed to know that I believed in them. And it was important to listen to their dreams and hopes, even if they never came to fruition. My own husband needs to share these dreams and hopes, it’s my job, as mom and wife, to dream and hope with them as they navigate God’s will. The one thing I wanted my sons to also know is that God loved them even more than I did. And that’s saying something because I love them fiercely! So, no matter what happens in their life, they needed to know that God is on their side; He is there to encourage, redirect, forgive, love, instruct; He will never let go of them. Thank you! You have some great points here 🙂 I love hearing from moms whose children are now grown. Thanks for sharing your wisdom and insight!